Seen this before? Could there be some setting I have wrong in TCC? Hoping it's not a bug. No problem here, but I am running a newer release than you are. I am on 32-bit OS. Have a look at CMD's %PATH%. Could "Win64 File System Redirection" (OPTION\Startup)have anything to do with it? It's far more likely that you've got a different environment / registry / etc. configuration in the native TCC window vs. the CMD window. 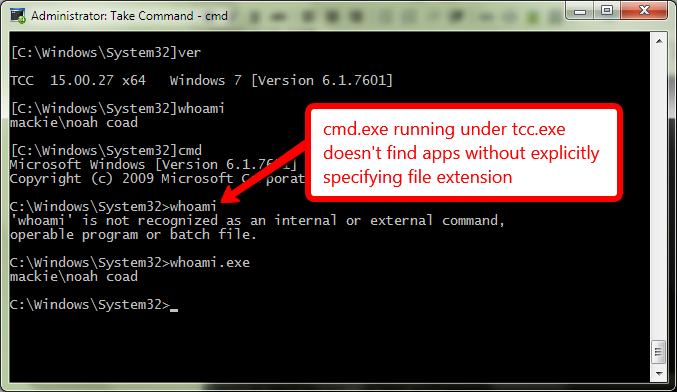 Try starting a CMD window, then run TCC, then CMD, and see if you get the same behavior. Worked fine in TC, but when dropping to cmd.exe from TC, cmd.exe got overwhelmed. Removing the %pathext% fixed the issue. Thanks to everyone for quick and thorough replies.